What got you into BMX?There was a large group of older kids in my neighborhood all with first generation BMX bikes. They all rode on some dirt trails just a few blocks from my house. I was about 8 years old at the time. One of the riders was the current state number 1 in ABA at the time. Michael Mays. He rode for a bike shop called Peddlers East which was within bike ride also. One day he just rode over to me and asked if I would be interested in racing. I said yes. He rode home with me and explained it all to my dad. A few months later we went to the local track in Vineland at Giampetro State Park. I raced 9 novice and won my first time. That was all it took. I was hooked. What year did you start racing? 1980. How long was it until you turned expert? 5 races. The ABA rules at the time. What was it like racing in one of the toughest NJ ABA districts of the era, against guys like Rich Farside and Mike Lynch? It was very tough and competitive. Rich and Mike were older than I was so I never had to race them but we all chased points together. We would all meet up at the same tracks. After a while we travelled together or gave each other rides when a parent could not drive. At one time, during the summer of 1982, we were racing every night of the week, twice on Saturday and twice on Sunday. I finished number 3 in the state my first year and number 2 twice after that under the ABA system. We were all racing both sanctions at that time too. In 1983 or so I went to the NBL full time. It was crazy though, we raced all over the northeast. New Jersey, New York, Delaware, Maryland, Pennsylvania, and New Hampshire. We also raced during the winter when tracks were available. In 1981 and 1982 we raced at the Jersey City armory. In 1982 and 1983 we raced at my dad’s track in Egg Harbor City. The big winter race every year was the Iron Man Classic in Howell, NJ. Tom Rubell put this on every year and instead of a trophy, the top 3 got a new helmet. Fun race but crazy cold. Did you have any sponsors back then? Yes. Locally I was sponsored by Peddlers East for a year or so. Then for several years I was sponsored by Beacon Auto Stores and was team captain along with Joey Layton. Then I got a factory ride with Sekai Bicycles for a year or so. After that I switched to NBL I got a factory ride with JL Leathers. Then they got out of BMX and I went to Wooden Wheels bike shop out of Delaware. Stayed with them a year or two then in 1986 or so I got asked to join the TNT factory team owned by the Zalewski’s. I stayed with them until I stopped racing. Best story from one of the races. Raleigh, NC around 1986. It was an indoor race in like February. Someone for got to tell the guy who bought the dirt not to store it outside. It got cold and icy and it froze. When they brought it into the arena it thawed out and became mud. They held the race but it was tough going. A lot of people got off their bikes and ran. I had stacked mains both days but made them. Magazines called it the Play-Dough Nationals. Most memorable race? Three. First one was the 1981 ABA Grand Nationals in Oklahoma City, OK. We DROVE from Jersey and it took 2 days to get there. I made the main and finished 4rth. Second, NBL Christmas Nationals in Columbus, OH in 1985, they had the Presidents Cup the day before and I won 15 Cruiser. Third, Flemington, NJ in 1983, I had broke my arm the month before but raced with a cast on and cut it out so I could hold my bars. I won the race and the State Championship. Who did you ride and or practice with back then? Started riding a lot with Rich Farside who lived not too far away. We would hook up at a local place in Vineland called Crater Valley. It was an old pit that locals had built trails around and through. It was awesome. After Rich stopped I rode a lot with Dan Hammell and guy’s from Egg Harbor. He was dating my sister then so we were around each other a lot. Then rode a bunch with Clay Goldsmid at his house over several summers. I was also allowed to build a track in my back yard so I rode all the time when no one else was around. At what point did you slow down from racing? 1989-1990. We moved from NJ to Kentucky. Rode some there and still raced some nationals then stopped so I could support myself. Do you check in at all to see what racing is like today? Not too much. I check some websites and still have some riding friends who will call or e-mail every now and then. If so have you ever thought of coming back around? Not really. I would be interested in a re-union event at some point. What are you up to today? I live in Florence, SC with my wife and family. My son plays travel Ice Hockey so we take him all over playing. We also ride dirt bikes together. I am going to school at night to get my B.S. in business and work hard on my career. I am an Operations Manager for a large manufacturing firm. 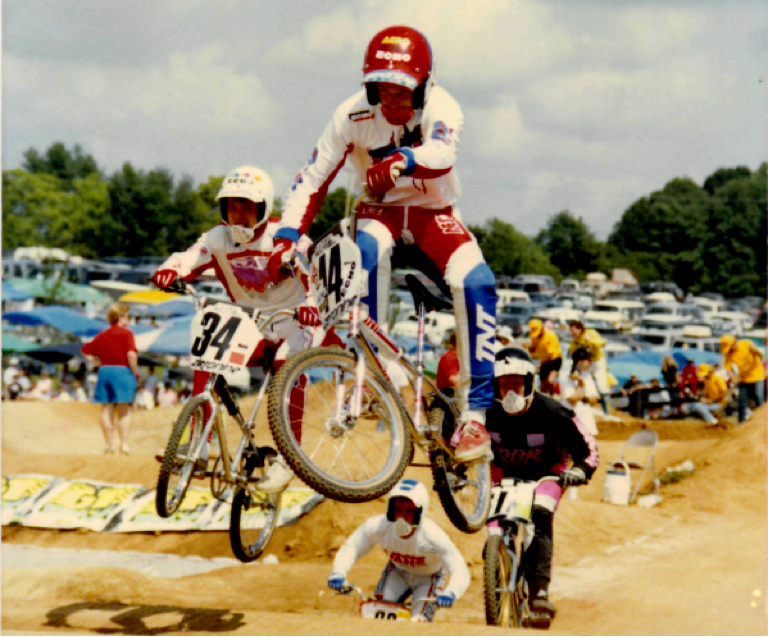 Do you feel as though your years in BMX helped you prepare for later challenges in life? Absolutely. There are some things you can learn out of a book but there are other things you can’t. Things I consider myself great at today like public speaking and talking to customers come directly from my BMX days. I used to have to speak with sponsors, I occasionally announced some races at my dad’s track, wearing a sponsor’s logo and representing them in a professional manner at an early age all have helped me shine in areas other people read about in books but cannot do. Even things like how to travel and pack, plan, and being exposed to things in about 38 states have all helped. Most of all, how to win and how to deal with a loss. Business is about these two things on a daily basis! Who would you like to thank for helping you during your years racing BMX? First, my Mom, Dad, and Sisters. They were my biggest fans and supporters. They also had to take me to all those races. They missed a lot of work and school. They all made sacrifices so I could do what I loved and I am sure I was not as thankful as I should have been. Today I pay the dues back by taking my son all over playing hockey and getting up on Sunday for a 6:00am game. Second, Michael Mays, not sure where he is today but he got me started and hooked. Third, the Zalewski Family, and all the other great families we met during the BMX racing days. Too many to list here but these others stand out: Farsides, Lynches, Hammells, Luden’s, Bohren’s, Stifflers, LeVann’s, Lloyd’s, Brian and Allan Foster. Big thanks to Paul for giving us here in BMXNJ land a little more insight into the history of our sport in NJ!